Working as CEO of Acacia Network allows Raul Russi to help thousands of people every year, but it was a debilitating and life-changing injury (in the line of duty) that helped him get to this point. Police officer Raul Russi laid in a hospital bed in Buffalo, New York, nursing three bullet wounds. On the TV posted above his bed, news reporters recounted the story of his valor. The prognosis was positive. A Purple Heart was in his future. Still, a great injustice loomed on his mind—and it had nothing to do with his assailant. Armando Russi brought his son Raul to the United States in the early 1940s when migrant farming still painted the picture of economic depression. At the time, Raul was just 11. He had spent the first decade of his life looking up to his grandfather, Faustino, a World War I veteran with the kind of life experiences that taught him to value the important things. Faustino believed most firmly in self-reliance and that everything followed from it. Achieve it, and a man could provide for his family. Taint oneself with crime or dishonesty and a man would cut himself short. From the old man who grew his own food on 30 acres of mountain land, a young Russi learned lessons that would be the foundation of his work. After placing second on the entrance exam, Russi becomes the first Puerto Rican officer on the Buffalo, New York, police force. While there, he learns of the corruption within law enforcement and the deplorable conditions in the Hispanic community that combine to make life for his fellow community members a struggle. Russi becomes a political activist and helps elect the first Puerto Rican judge in Buffalo. He serves as assistant superintendent of the Erie County New York Correctional Facility and gets promoted to superintendent within a year. Russi becomes chairman of the New York State Parole Board. During his tenure, the number of Latino parole officers increases from 50 to 300 out of 3,000. Russi becomes the first Latino sheriff of New York City. Mayor Rudy Giuliani nominates Russi to serve as commissioner on the Probation Board for New York City. Russi becomes CEO of Bronx Addiction Services Integrated Concepts System, Inc. (BASICS), a residential substance-abuse treatment facility for men. 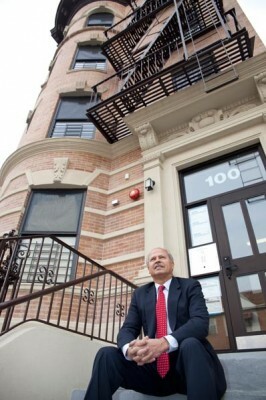 Russi later leads the effort in expanding the BASICS program by creating a separate entity, Basic Housing, Inc., a transitional-housing program for families affected by substance abuse, which has grown from 10 apartments in Manhattan to 1,100 units throughout the Bronx, Manhattan, Queens, and Brooklyn. Basic Housing is now the largest transitional family-housing program in New York City. BASICS and Promesa, Inc., a community organization offering a unique constellation of services in the areas of health, housing, and economic development, enter into an affiliation agreement and later create a new brand, Acacia Network, Inc. Russi becomes the CEO of the second-largest Latino-based nonprofit organization in the country. Russi helps orchestrate the consorting of United Bronx Parents and South Bronx Community Management to the Acacia Network and the expansion of services under the Acacia Network to the Western region of New York State with the affiliation of Capital District Latinos in Albany and La Rama, Hispanos Unidos de Buffalo, and Buffalo Hispanic Management Company, Inc. He and his father settled in Buffalo and sent for Mrs. Russi and the six children waiting in Puerto Rico in 1957. As if starting school in a new country three-quarters of the way through the year wasn’t hard enough, when Russi and his siblings entered Catholic school, Russi spoke only Spanish. The entire last quarter was a blank to him. Though he attended ESL (English as a second language) night classes when he was in sixth grade, by high school, he decided the race was lost. He was only hoping to graduate and join the ranks of Buffalo’s blue-collar workers—which he did—but as his own family began to grow, so did the expenses. Perhaps serendipitously, the police department in Buffalo was recruiting, so Russi took the entrance exam. He received the second-highest score and became the first Puerto Rican police officer on the force. He was in for a rude awakening, however. There was a tangible animosity in Buffalo at that time between the police and the Latino community. “All those things that now drive me, I realized within a year or so of being in the police department,” Russi says. “I realized the major issues that face our [Latino] community: unemployment, drugs, crime, and discrimination. All these things that I didn’t see when I was working as a machinist came rushing at me. I couldn’t deny that they existed.” Two experiences Russi had on the job changed him permanently. Both involved a gun. The first was a robbery that he handled as a young officer. He shot and killed the young perpetrator, and the experience stuck with him for several years. The other was the shot that landed him in Deaconess Hospital and ended his career with the Buffalo Police Department. One of Russi’s visitors in the hospital was a friend in the nonprofit sector. He asked if Russi’s pull with the mayor could help him get $20,000 to keep his social services organization open. Russi was baffled that his community needed this moment of attention to survive. After patrolling his own streets, witnessing unfair treatment towards the Latino community within his own department and standing as one man against the plight of many, he felt his impact as an officer was limited. “I made the determination that day to change the odds for our community,” he says. Russi started at the grassroots level, getting involved in local politics. He addressed the lack of Latino clout by campaigning for the first Puerto Rican judge elected in Erie County. 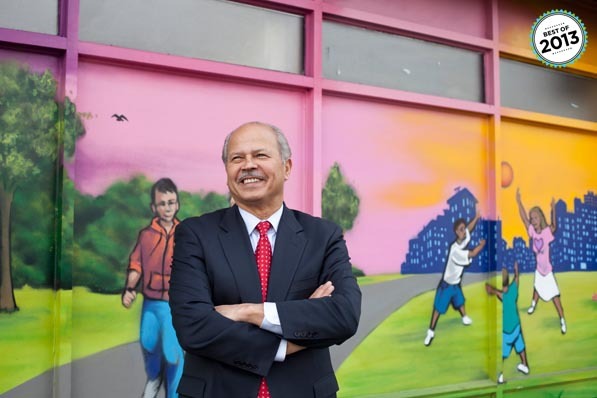 He helped merge three organizations to form Hispanics United of Buffalo, which continues to provide educational, language, housing, and preventative services to the residents of Buffalo. He was appointed superintendent of the Erie County New York Correctional Facility, followed by chairman of the New York State Parole Board and then commissioner of the New York City Department of Probation (DoP). And even though his work brought him back in the institution, Russi sought to make impactful changes. “I was always trying to change the influence of Latinos wherever I went,” he says. There were 50 Latino parole officers at the DoP when Russi arrived; when he left there were six times as many. After 34 years in law enforcement, Russi still felt his business was unfinished. A friend suggested nonprofit work at Bronx Addiction Services Integrated Concepts System, Inc. (BASICS), a men’s addiction-recovery facility—a “real diamond in the rough of the Bronx,” as his friend called it. It didn’t take long for the Russi to realize he had found his calling. Not only was he working directly with his community, but he was affecting lives 100 to 1,000 at a time, first in the Bronx, and then in Manhattan, Buffalo, and Albany where his initiatives like Horizon Village and his current charge, Acacia Network, Inc., have expanded. Acacia’s clients are nurtured on that same philosophy, learning to become self-reliant so that others—be they family, employers, or society—can rely on them. Russi has enough success stories to write a book. He tells stories of a former felon–turned–security-service entrepreneur, of a father who called him late at night to thank him for the first Christmas Eve in five years that he and his children spent warm and secure in an Acacia housing unit. When he stops in to his local office-supply store, someone yells out, “Russi!” and reintroduces himself as a BASICS alum, now married and out shopping for his son’s school supplies.